What is a pledge? A pledge is a heartfelt, documented financial commitment to the ministry and well-being of St. Alban’s. What’s wrong with just putting money in the collection plate? St. Alban’s is grateful for all financial contributions, but pledges provide the Vestry with the expected income information that is essential to preparing our annual budget. St. Alban’s simply cannot operate and thrive without a reasonable estimate of its financial resources. And your pledge reinforces the importance of God and St. Alban’s in your life. Is my pledge really needed? Doesn’t the church receive support from the Diocese or an Endowment? Our annual operations depend almost entirely upon pledges. And as a member of the Diocese of North Carolina, our church contributes to Diocesan ministries, rather than vice versa. We do hope to grow our Endowment in the future, but right now it is small and even if it were to grow, it would not be used for general operations. The amount, of course, is a personal decision, but it should be grounded in your faith and commitment to the church’s ongoing work of building God’s kingdom. Scripture lifts up the tithe (ten percent of one’s income) as the aspirational giving level. We urge everyone to aspire to that goal, while we understand that reaching such a goal is a process. Regardless of the size, we hope you will make St. Alban’s your primary philanthropic priority. Your pledge should not be an afterthought or a casual decision. What is the average pledge? Last year, the average pledge was $2,900. Yes. Only a handful of necessary people know the actual amounts of individual pledges. At the end of the pledging season, an alphabetical list of all who have pledged is published, to acknowledge and thank those who have committed to St. Alban’s vision and growth. Our pledging season begins September 30, 2018 and continues for the weeks following. November 11 will be the Annual Meeting and Ingathering Sunday, when we ask God’s blessing upon all the pledges we have received for 2019. Of course, new pledges are also welcomed and appreciated after November 11 and throughout the year. What if my situation changes and I cannot fulfill my pledge? We understand that life’s circumstances do change, often unexpectedly. In this case, please alert the finance director, so that our records can be amended and the clergy can respond with pastoral care as needed. Make regular payments by check. Use your bank’s online bill paying system and set up regular monthly or other periodic payments directly to the church. Use appreciated stocks, donor adviser funds or IRA payouts to pay your pledge. (If you are over 70 1⁄2 years of age, your IRA payouts should be fully tax-deductible). In either case, please alert the finance director to ensure that your pledge payment is properly credited. Annual Giving is about much more than "meeting a budget" and "paying the bills". Good Christian stewardship always begins with gratitude. In gratitude for God's abundant generosity to us, we generously share our resources with each other so that we can carry out our shared mission as a parish community. In the days immediately following Jesus' resurrection and ascension, we are told that the first followers of Christ came together as a community and shared all things in common (Acts 2:44-47). So, from its earliest days the Church has been a community that depends on its members sharing their resources for the common good. It's also important to note that this was done not out of a sense of obligation, but rather with “glad and generous hearts” (v. 46). They shared and gave out of a deep sense of gratitude for all that God had done for them, as most fully revealed in the life, ministry, death, and resurrection of Jesus Christ. We seek to emulate this apostolic model at St. Alban's as best we can in our context and circumstances. You may call or email our Financial Director, Erin Garrett. The office phone is (704)892-0173. September 30th, we begin our Annual Giving season, when we each pledge our financial commitment as part of the St. Alban's family. This year our theme comes from the Gospel of John, Chapter 15, verse 5, when Jesus says “I am the vine, you are the branches. Those who abide in me and I in them bear much fruit.” You are invited, in light of God’s abundant love and generosity, to prayerfully consider your annual financial contribution to St. Alban’s and then make a pledge for the coming year. 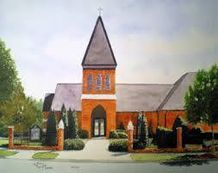 St. Alban’s needs our financial support to thrive and grow. St. Alban's is going to keep bearing good fruit, and you are invited to be a part of it! What should I consider as I determine my pledge? Prayer. We are members of St. Alban’s because of our love and commitment to Christ, so don’t forget to ask for God’s help to guide you. Your life’s blessings. Your pledge is a response of gratitude and joy for all you have been given. St. Alban’s impact on your life. Is it the liturgy, our service to others in the community and the world, our life-long Christian education, the music, or the fellowship and fun? All of these things are made possible by our pledges. St. Alban’s is not just another “charity.” We all give to worthy causes, but the church is more than a non-profit. We are a family. We are God’s family. Your pledge is an affirmation of your faith and commitment to ensure the vitality of our parish, as we have done since 1956. Challenge yourself. In the end, pledging is about letting go of our agenda so that we can say yes to God’s agenda for us. It is when we stretch beyond the limits of our comfort zones that true transformation happens. Our Goals. In 2018, 186 pledges were made for a total of $544,242. In 2019, our goal is to have 200 pledges for a total of $570,000. This increase will allow St. Alban's to retain our highly valued staff, maintain our facility, and enhance our Outreach ministries. You are invited to be a part of this exciting effort. Every pledge matters. Our annual budget is made up of pledges of all sizes. Your pledge makes a difference, no matter the amount.